The author (right) with astronaut and Senator John Glenn, who passed away this week. On the morning of May 20, 1927, 25 year old U.S. Air Mail Pilot Charles Lindbergh left the Garden City Hotel and headed the short distance to Westbury’s Roosevelt Field, as a crowd of over 500 onlookers greeted the young pilot, as he prepared to make history. The field was named not for President Theodore Roosevelt who called Oyster Bay, Long Island, home, but for son Quentin Roosevelt, who took flying lessons in Mineola, Long Island. Quentin would make the ultimate sacrifice, as the young 20 year old United States Army Air Service pilot lost his life in aerial combat over France during the First World War in July 1918. During the late 1920s, Long Island, NY, was nationally known as the “Cradle of Aviation,” and the new aviation industry boomed on Long Island due to its level terrain and its close proximity to New York City. Little would Lindbergh know, as his famed Spirit of St. Louis lifted off the ground and cleared telephone wires on that momentous May morning, that a plumbing family from the small village of New Concord, Ohio named the Glenn family, was keeping a close eye on him and the Long Island airfield that got him off the ground. The freckled faced boy nicknamed “Bud” in the years to come would become an expert builder of model airplanes and two years after Lindbergh’s 1927 flight, young John would take his first flight in an open-cockpit Waco biplane with his father outside Cambridge, Ohio. As a lifelong resident of Long Island, I knew from an early age of the importance of Roosevelt Field and Charles Lindbergh’s Transatlantic Flight. As an undergraduate student at Hofstra University in 2012, I became dismayed when I learned that the historic takeoff site was on the auction block and the Lindbergh Monument was threatened by development. I successfully encouraged the Town of Hempstead to preserve the site and in 2013 it was declared a Town Landmark. In October, 2014 when I met Senator Glenn for the first time he asked me where I was from and I was proud to say, “Westbury, NY, where Charles Lindbergh began his Transatlantic Flight from.” Senator Glenn smiled. I am currently writing my graduate thesis on the life and legacy of Senator Glenn and have taken up a new project to preserve Senator Glenn’s birthplace home in Cambridge, OH. Adam Sackowitz is a lifelong resident of Westbury, NY, and spearheaded the preservation effort of the Lindbergh Monument and Transatlantic Takeoff Site in 2012, which resulted in the Town of Hempstead designating the site as a town landmark. 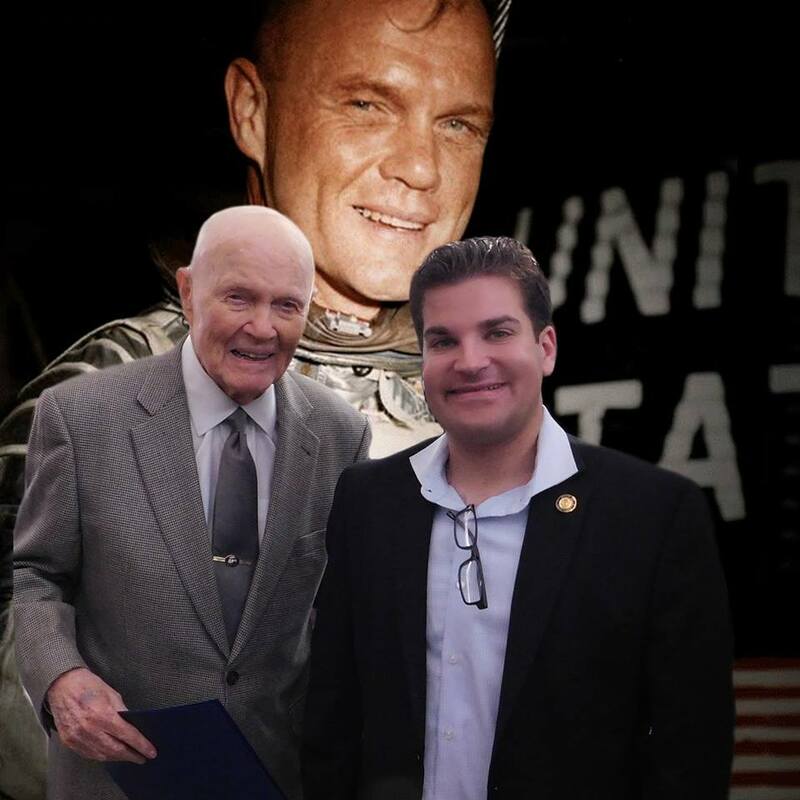 Sackowitz is currently a graduate student studying Public History at St. John’s University and is writing his graduate thesis on the life and legacy of John Glenn. Sackowitz is currently working with community leaders in Cambridge, OH, on the preservation of the Glenn Birthplace.